The title of 2018 Developmental Coach of the Year was awarded to Karen Pavicic of Surrey, BC, for her dedication to coaching developing athlete, Laura Hall of Ladysmith, BC. 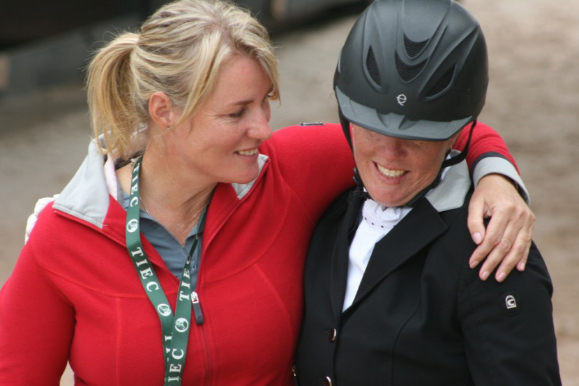 Pavicic has ridden for Canada at several major games, and now shares her years of expertise with Hall as an Equestrian Canada certified High Performance 1 Dressage Coach and National Coaching Certification Program Level 3 Dressage Coach. Under Pavicic’s watchful eye, Hall earned several top-three placings in 2018, just one year after making her FEI debut. The highlight of Hall’s 2018 season was her participation in the 2018 FEI World Equestrian Games Test Event CPEDI 3* in Mill Spring, NC, with Wendolin (Metall x Amethist), her 16-year-old Dutch Warmblood mare. Pavicic’s incredible coaching skill and enthusiasm has bolstered Hall in her notable growth, both as an individual athlete and a representative of Canada on the world stage. When not coaching, Karen, who now rides for Croatia, can be seen in the competition ring hersef aboard the handsome Totem. The seven-year-old Hanoverian gelding by the famous Totilas achieved some impressive results during the recent Florida show season. Karen (aboard Lionheart) was a member of the 2007 Pan American Silver Medal Dressage Team who competed in Rio de Janeiro, Brazil. Karen (aboard Don Daiquiri) represented Canada at the 2014 World Equestrian Games held in Normandy, France. Karen got her start in horses as a Pony Clubber, earning her "A" level status. Karen is also a graduate from the Young Riders ranks, where she earned Team Gold and Individual Bronze medals for Canada.